SKU: 521664. Category: Decorative & Dining, Educational, Wood Toys. WARNING-CHOKING HAZARD Small Parts. Not for children under 3 yrs. 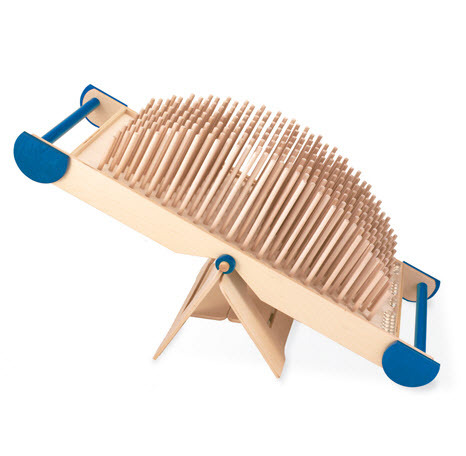 The Giant Sound Hedgehog is a colossal, brilliant wooden toy that is truly awe insiring. Tilt on its pivot, drop a marble, and it produces tones of varied pitch as it rolls through the wood spines which are graduated in length; or release a handful of marbles for a dazzling shower of sound! Includes a cloth bag of 26 glass marbles. An intriguing, impressive conversation piece. (Approx. 42.25″ x 23.6″ x H 19.7″) Made in Germany. NOTE: SHIPPING NOT AVAILABLE outside of the San Francisco Bay Area. Please email inventory@zebrahall.com for more details.